Peak VT: What Goes Down Must Come Up? Thank goodness our markets are so eminently rational. 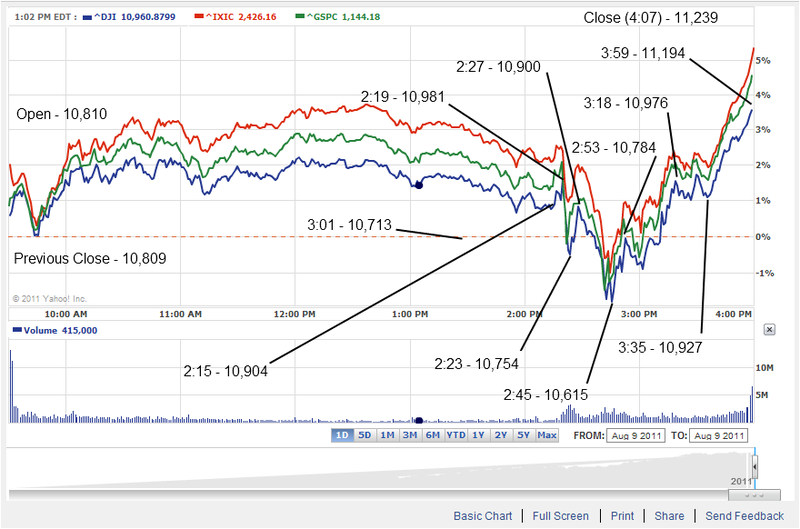 Here's an annotated chart of today's market movements. In 30 minutes, starting at 2:15 when the Federal Reserve Open Market Committee released its latest meeting statement, the DJI went up by 77 points, then down 227 points, then up 146 points, and finally down 285 points. 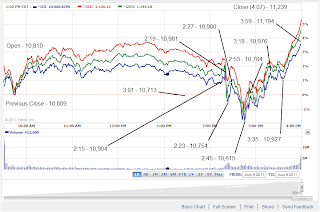 In the 75 minutes from 2:45 to the close (the computers took about 7 minutes to spit out the final number) the DJI increased 624 points, or about 5.8% from the intra-day low. Is there any possible justification for this kind of herd behavior?